Washington Capitals Hoist First Stanley Cup After Dramatic Win Over Vegas The championship is the first by a D.C. team in one of the big four U.S. sports leagues in a quarter century and prevents a fairy-tale ending to the Las Vegas hockey team's first season. 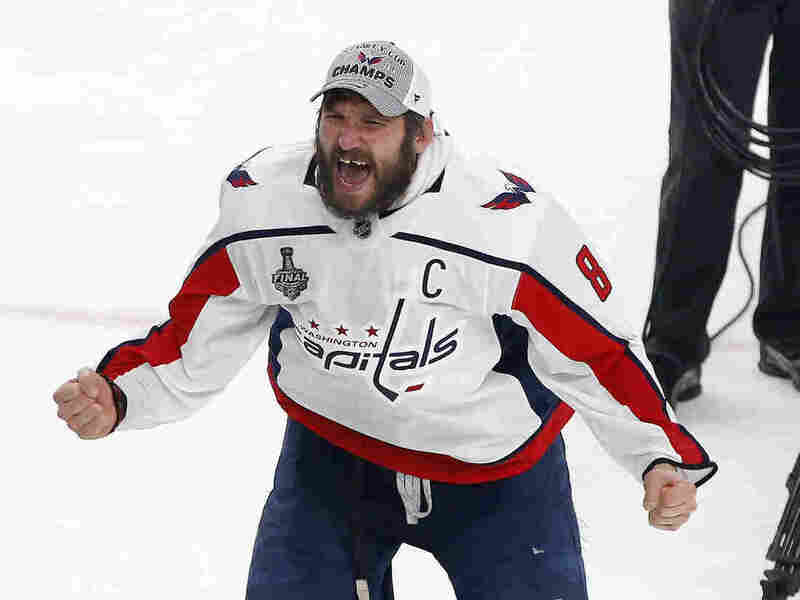 Alex Ovechkin celebrates on the ice after the Capitals defeated the Vegas Golden Knights to win the Stanley Cup. Ovechkin was awarded the Conn Smythe trophy as the best player in this year's playoffs. Washington, D.C., has had, by some measures, among the most miserable sports fans in the United States. The city ended a quarter century of futility Thursday night as the Washington Capitals beat the Las Vegas Golden Knights 4-3 to win the NHL's Stanley Cup. The Capitals' first championship is Washington's first in one of the country's big four professional sports leagues since its NFL team won the Super Bowl in 1992. Thursday also marked the 40th anniversary of Washington's only NBA title. The Capitals win stops short Las Vegas' stunning run to the Stanley Cup. An expansion team, the Golden Knights didn't exist 14 months ago. After the game, league Commissioner Gary Bettman told Las Vegas' home crowd it was "the best first year any team has ever had." The Capitals' superstar captain, Alex Ovechkin — awarded the Conn Smythe trophy as the best player in this year's playoffs — scored his league-leading 15th goal of the playoffs in the second period, Devante Smith-Pelly scored his third goal of the series while falling to the ice to tie the game 3-3, and Lars Eller put Washington ahead for good with 7:37 to go when he hammered home a puck that had sneaked behind Golden Knights goalie Marc-Andre Fleury. "It means everything," Eller told The Associated Press. "You couldn't write the story better." Goalie Braden Holtby stopped 28 of 31 shots against him, including three of four attempts during power plays. Reilly Smith led the Golden Knights with a power play goal, his fifth of the playoffs, and an assist. Fleury, long one of the top goalies in the league, stopped 29 of 33 shots, making several acrobatic saves. An earlier version of this story and a photo caption incorrectly said Devante Smith-Pelly scored the game-winning goal. His goal tied the game in the third period; Lars Eller's broke the tie.